In large bowl of stand mixer, stir together yeast, sugar and warm water; let stand 3 minutes. Add flour; mix with dough hook attachment until dough forms a smooth, elastic ball. Grease large bowl with shortening; place dough in bowl, turning dough to grease all sides. Place in cold oven 50 minutes or until doubled in size. Remove bowl from oven. Heat oven to 425°F. Gently push fist into dough to deflate; divide dough into 8 equal pieces. Using your hands, roll each piece of dough into a rope twice as long as hot dog length. Pour baking soda into 6- to 8-quart Dutch oven or stockpot; fill with water. Stir with whisk until baking soda is dissolved. Heat to boiling. 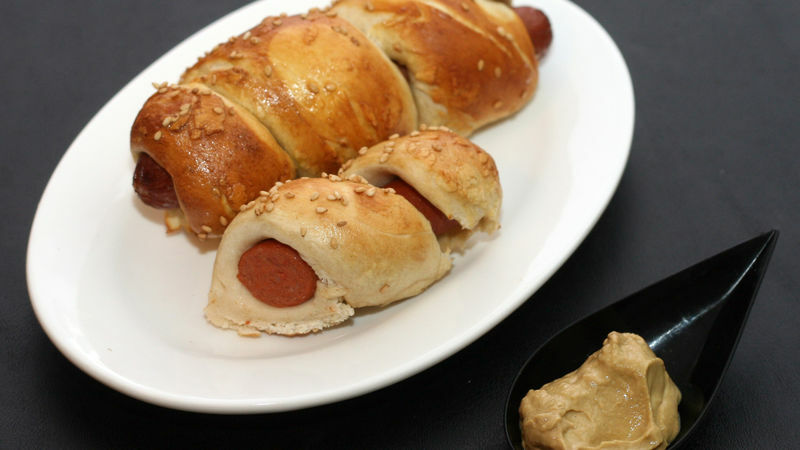 Meanwhile, wrap each hot dog with dough, pinching ends together tightly (secure with toothpicks if necessary). Line large cookie sheet with cooking parchment paper. Using tongs, dip each pretzel dog in boiling baking soda-water mixture for 30 seconds. Place on cookie sheet. Brush dough with egg; sprinkle with sesame seed. Bake 12 to 15 minutes or until golden brown. Serve warm. These dogs taste best when served with a strong, coarse-grained mustard for dipping. Make it cheesy! Place a 3x1/4-inch stick of Cheddar cheese next to the hot dog, then wrap the dough around both.